Hearts really could have done with having a fit Uche Ikpeazu. His robust no-nonsense approach has served the Jambos well this season, especially against the more physical Premiership defences. The Rangers centre-back pairing of Connor Goldson and Joe Worrall were there to be got at. However, the Englishman’s replacement Craig Wighton’s lean frame failed to ruffle the feathers meaning the visitors’ only genuine threat were from set-plays. Hearts showed a bit more belief in the final 15 minutes, albeit Wighton had the support of substitute Aidan Keena who had joined him in attack. The Gorgie faithful will hope Ikpeazu is fit enough for the visit of city rivals Hibs this weekend. 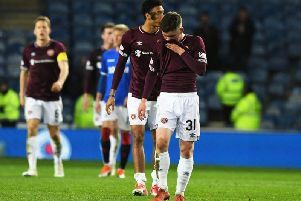 It was backs-to-the-wall stuff for the Jambos as Rangers tore out of the traps from the first minute, threatening to build on their two-goal lead every time they ventured forward. On several occasions Hearts were forced to put nine men behind the ball that limited their options when they did get the opportunity to break forward. It became apparent very early on that the visitors’ best chance of a goal was likely to come via a set-play. And so it proved as captain Christophe Berra twice went close with first-half headers that forced Allan McGregor into action. But it was the pace and accuracy of Oliver Bozanic’s deliveries that really caused panic in the Rangers rearguard. His free-kicks and corners could be a real asset to Craig Levein’s men going forward. Could greater belief have borne more fruit? Craig Levein – as expected – set up his side with the intention of making it difficult for Rangers to break the Tynecastle men down. However, that plan quickly went to pot as the home side’s slick interchanges in and around the box eventually took its toll as the Hearts goal was breached twice inside the opening 20 minutes. It was only when Levein elected to bring on Aidan Keena to partner Craig Wighton in attack that Hearts carried more of a threat in the final third. Olly Lee also tried to work the ball into the channels as the Jambos went in search of a consolation. Rangers were far from their best where a bit more belief from the visitors might have paid dividends.